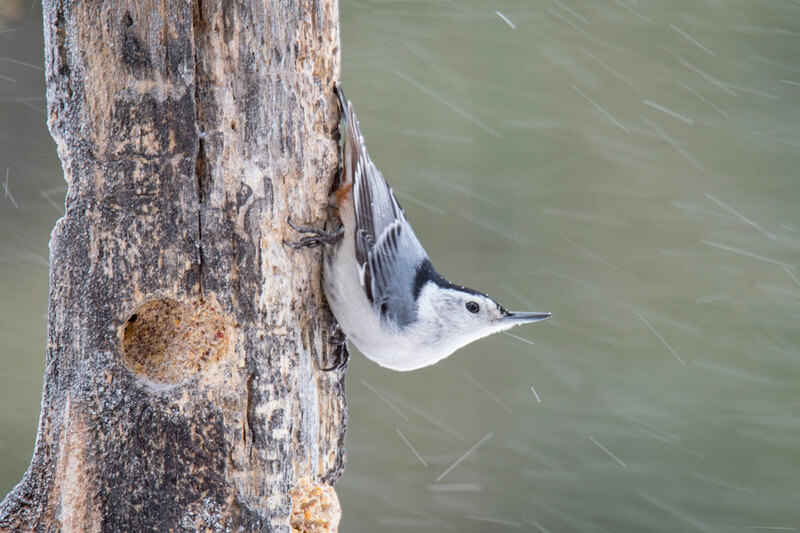 I have a pair of White-breasted Nuthatches turn up during the last snowstorm. 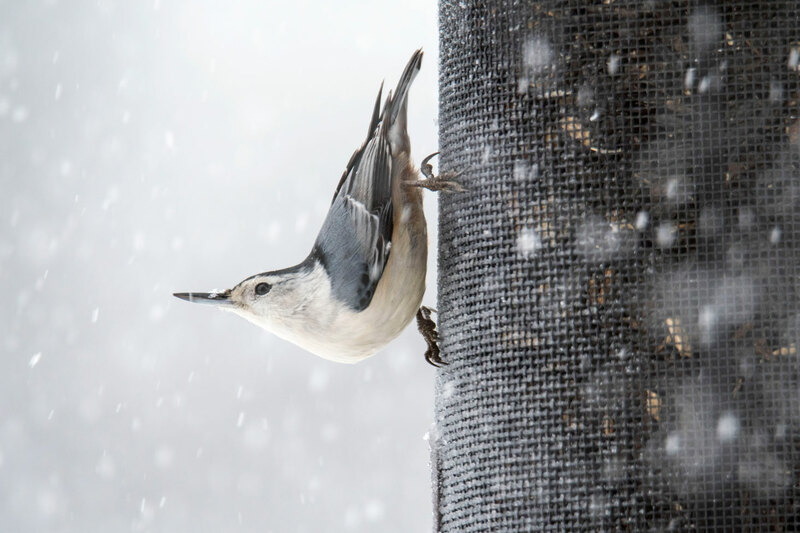 Some of the other birds at my feeder during the recent snowstorm. More bird photos from Canadian Hill Farm. 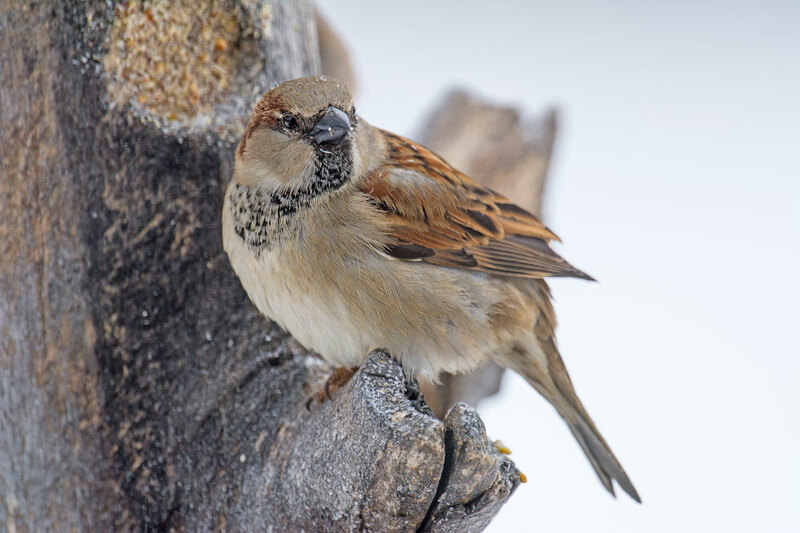 Since we really haven’t had much of a winter I’ve spend more time than usual photographing birds. I managed to capture this photo late in the day when the sun was shining on some pine trees in the background. I managed to capture this photo just as a Dark-eyed Junco cleared the snow off of her back. These are some of the birds at my feeder during the first few weeks of spring. The Downy and Hairy Woodpeckers have been around all winter and they have been very active this spring. I see them a lot when I put out the Peanut Butter Suit. For some reason they really like it. 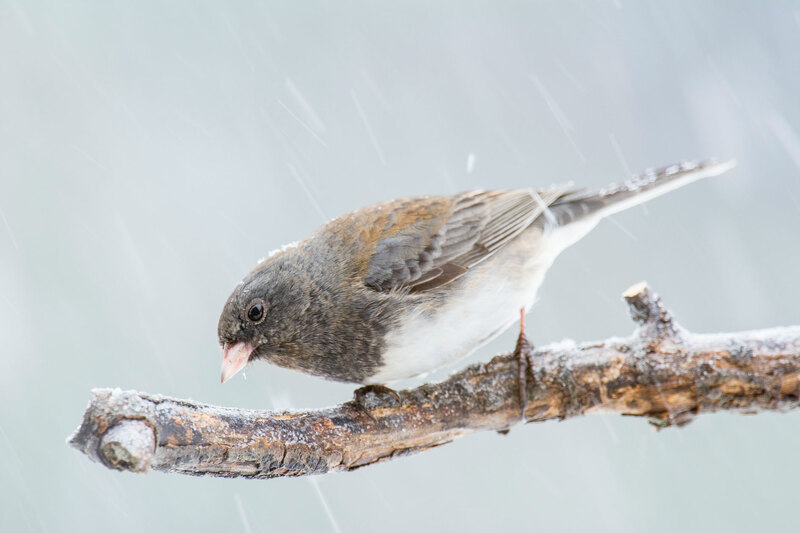 The Dark-eyed Juncos are around all winter but they seem to leave just about the time spring came. They were gone for a couple of weeks but are back again. I’m thinking the birds around now are migrants that are just stopping off to resupply. A small number of Pine Siskins have been around all winter and they are still around. 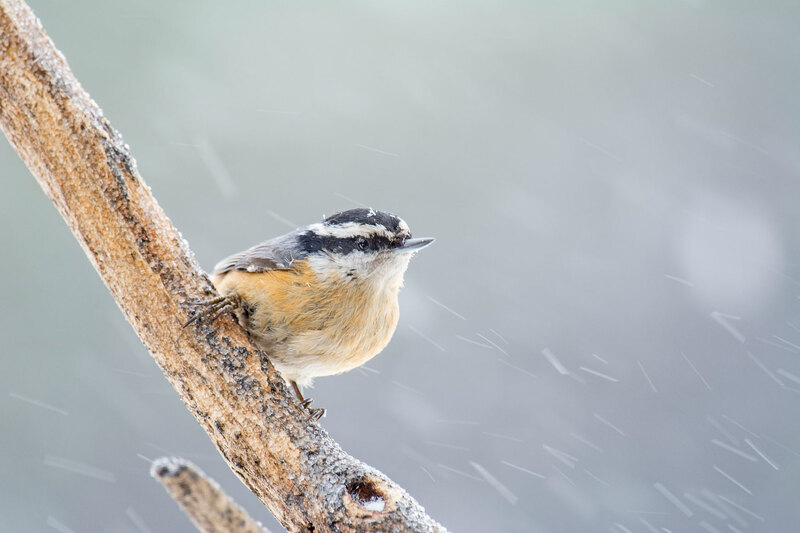 The White-breasted Nuthatches have been around all winter. I still see them at the feeders. One in particular likes to grab a Black Sunflower seed and then fly over to the fence post and try and crack it open. The one bird that has returned from the south is the Song Sparrow. A couple of them have been hanging around the feeders and the pines in front of the house. they usually nest in the pines. 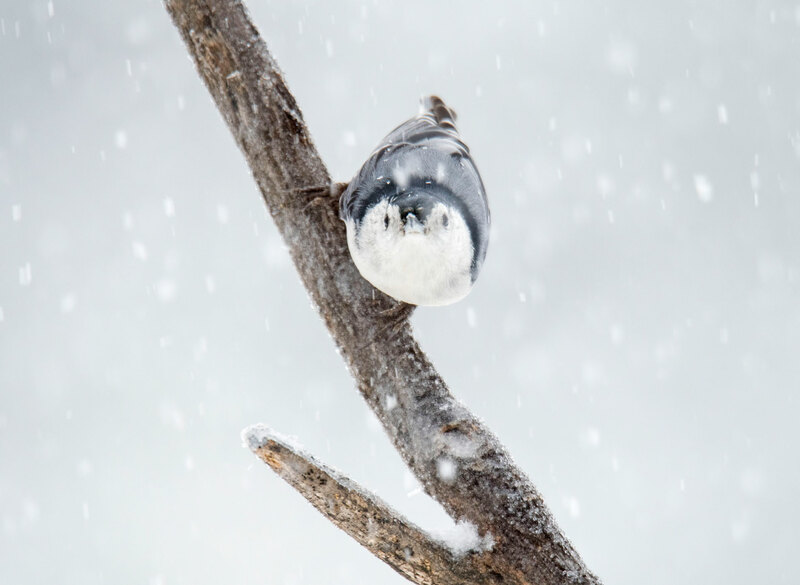 During the recent snowstorm I managed to capture a relatively large number of photos showing two birds. 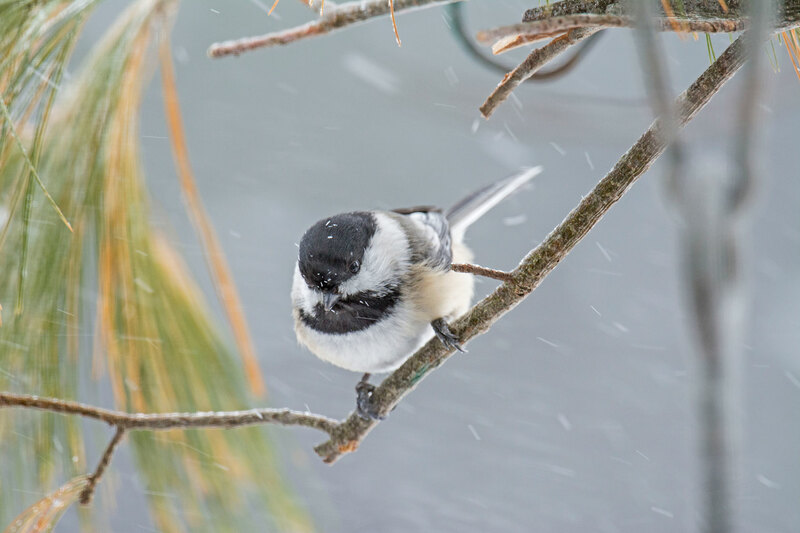 Generally I photograph single birds but there were so many birds around during the storm that they were packed around the feeder. A few days ago we had, what was supposed to be, a brief morning snow squall. I had an appointment in town in the morning and was disappointed that I would miss the opportunity to photograph birds. As it turned out the snow squall turned into an all day event giving me an opportunity to get some great winter bird shots. 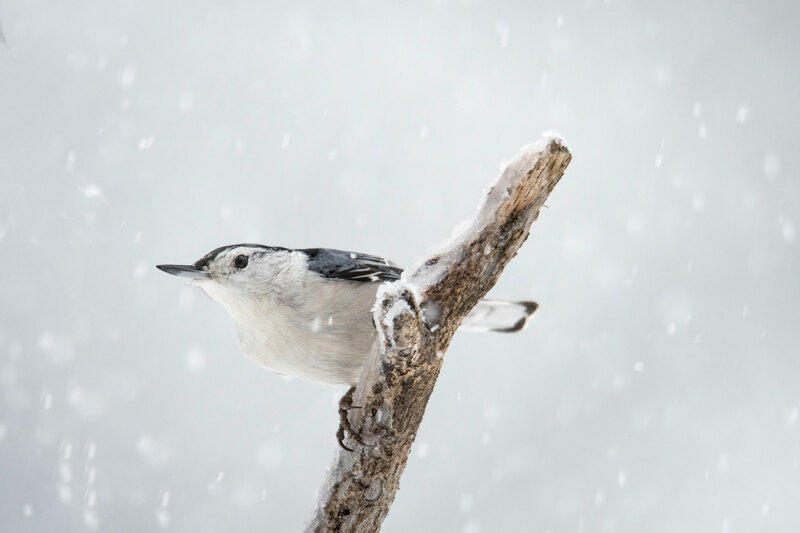 The White-breasted Nuthatch is another bird that doesn’t always show up at my feeders. I had a pair appear this past summer and they seemed to have been joined by another pair for the coming winter. Just before winter ended we had a snowstorm so I tried to photograph some of the birds that were hanging around my feeders.